Wedding tradition requires you to have something old, something borrowed and something blue. While you figure out how to do with the first two, we have an interesting suggestion for your something blue. How about dressing your bridesmaids in shades of blue? Blue is a color that goes well with most skin complexions. So, we do not see any of your girls complaining about your choice. What do you say? Does the idea sound interesting? We have lined up our favorite blue bridesmaids dresses in all shades of blue, so browse through and make your pick. This beauty in navy is as good as a neutral, and can blend into most color palettes. The dress features spaghetti straps and an asymmetrical hemline, with a floral waistband detail adding a special touch. 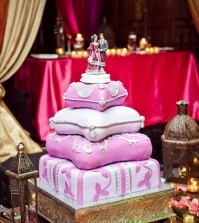 Don’t you think it will look gorgeous at a beach wedding? Pair it with white or blue bouquets, and you will have a stylish combination. Dress your damsels in this majestic marine bridesmaid dress, and they are sure to love it. A simple design that suits every body figure, the long gown is perfect for a classic reception. 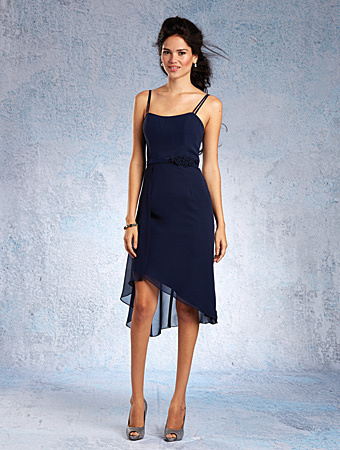 The fit and flare skirt and sleeveless scoop neckline elongate the torso, making your bridesmaids look tall and lean. The best thing about this dress is that it will form a beautiful combination with your white wedding gown. I can already imagine how pretty the wedding photos will be! Another one of our favorites from the Mori Lee Collection, this dress is youthful, fresh and just perfect with some fantastic details. The single shoulder strap and angled neckline with the ruffles have a playful vibe. The A-line silhouette is universally flattering, and the gathered waistline with the bow detail will make your bridesmaids look younger. This dress is great for a casual wedding party, and is practical and cheerful for an outdoor wedding. Make this your choice for your summer wedding, and bring the color of the tropical seaside to your wedding venue. Brighten up your wedding ambiance with your bridesmaids in this brilliant blue gown. Perfect for a formal event, the dress has a draped pleated bodice, that tapers towards one side and ends in ruffles that daintily flow towards the hemline. The pattern of the dress is such that it emphasizes the natural curves of the wearer, and your bridesmaids will love to show off their well-toned figures in it. The sweetheart neckline makes it perfect to accessorize with your choice of accessories. It is a dress that isn’t too loud, yet makes a dramatic statement. Your bridesmaids will appreciate the fashionable choice, so you can fall in love with it already. How did you find this collection of dresses in blue? Most of these dresses are available in other colors as well. 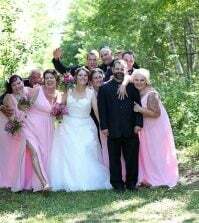 So, if you like the pattern, or the dress, or would like to check out other available options, come visit our bridesmaids collection online at Best for Bride today. Wow, that darker blue looks hot as hell! Love the color blue. I really like a more pastel shade, but that dark blue looks awesome! That Jasmine Belsoie L174016 is stunning. I love it and it will look great with my dark brown hair! Um, the Alfred Angelo 7337S please. Thank you!